I first ran into Cathy West's books when I read Yesterday's Tomorrow. I so enjoyed it that I watched for her next release. Well, it's finally here. Here's a small blurb, and we'll chat on the other side! Julia and Reid are both dealing with huge hurts in their past. So large they shape who they are today. It's one of the things that really opens up this book. To deal with difficulties such as PTSD, abuse, and divorce you'd think Bridge of Faith would be too deep to wade through. However, Cathy handles these each in a way that brings hope and healing. She walks her characters through incredible depths and does it in such a way that doesn't ring with author intrusion. Their journeys are authentic and truly a backdrop for forgiveness, grace, and--of course--faith. 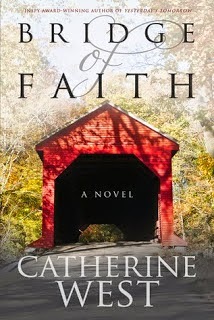 Bridge of Faith also has it's own fair share of twists and turns that keep you flipping the page. You root for the main characters and fall in love with her secondary cast as well. The dialogue is wonderful as is the movement of the plot and description of the scenery. Put all those things together and you'll find Bridge of Faith to be at the top of your summer reading list. You can purchase Bridge of Faith here. And as a really fun treat, Cathy is actually running a party with giveaways HERE today. Click on over for the fun. The event runs from 10AM-8PM MST. I won a copy of this book on Jeanne's blog, and I can't wait to read it. Cathy's an amazing author. Thanks for sharing your thoughts.